Whether you or your child are an absolute beginner or a snow crack, we offer something for everyone. Since 2004, ski + snowboard academy organizes full-day group ski and snow-boarding lessons in January and February each year. 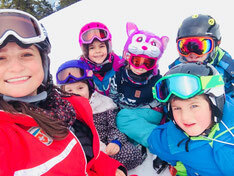 The lessons are offered as a five-day package on consecutive week-ends with lessons, lunch and ski tickets included for children and lessons only for adults. They take place in the fantastic ski area of Hoch Ybrig, just outside of Zurich, and they are conducted by qualified instructors of the local ski school, Schweizer Ski- und Snow-boardschule Ybrig. Originally designed for children, numerous parents request lessons for themselves each year. Therefore, it will now be open for adults as well, whereby the groups are divided into separate children and adult lessons. The program follows the official Swiss Snow League agenda and ensures that participants will receive a solid skiing and snowboarding foundation.